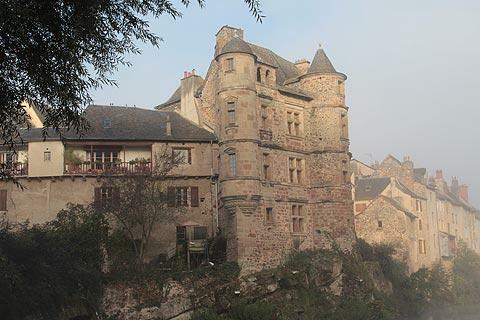 The village of Espalion is 30 kilometres north-east of Rodez in the Aveyron department of France, on the banks of the Lot River and set in attractive countryside between the two classified 'most beautiful villages' of Estaing and Saint-Come d'Olt. 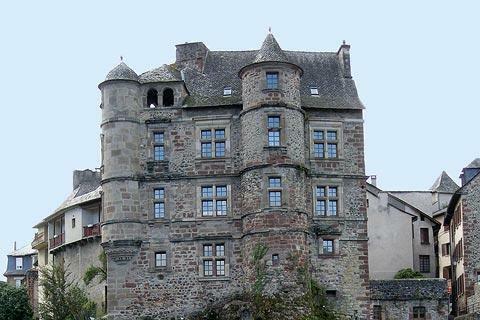 There is a ruined castle, the Chateau de Calmont d'Olt, high on the hill behind Espalion, further enhancing the setting. France This Way comment: Espalion is not a very large destination but there are several sites of interest and the area along the river-front and around the bridge is very lovely so a visit is recommended. 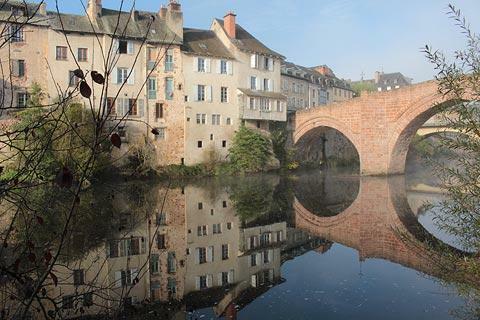 Start your visit to Espalion at the lovely old stone bridge over the River Lot, the Pont Vieux, which is now listed as a UNESCO World Heritage Site as part of the Pilgrim Way to Santiago de Compostela. A bridge has stood here since the 11th century, and the current bridge dates from the 14th century, although it was enlarged in the 17th century, and the three towers that originally stood on the bridge were removed in the 18th century. Along the river bank next to the bridge there are some very picturesque old tanneries, dating from the time when the leather trade was a major industry in Espalion, until the beginning of the 20th Century. In all there are about 20 tanneries on the right bank of the river and each tannery is equipped with a wide stone ledge for washing the hides. 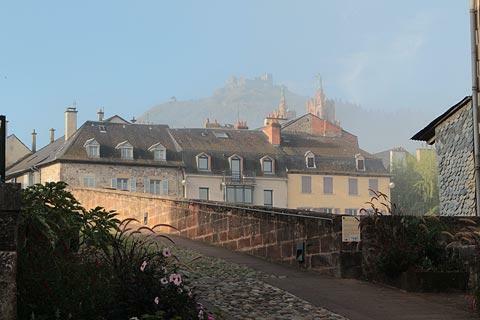 From the northern end of the bridge you can also see the Chateau de Calmont d'Olt behind the village. 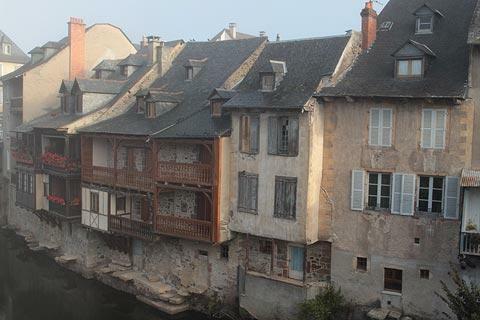 Follow Rue de la Grave from here to reach a part of the riverbank a bit hidden away with a lovely view of the bridge, the tanneries and the old palace. Return across the bridge and turn left, following the streets through the small pedestrian centre of Espalion. You will find Espalion tourist office here, and also the Old Palace. The Old Palace is a 16th century renaissance style building with large defensive towers overlooking the Lot river and a smaller decorative tower that overlooks the Foirail. Originally a castle, the palace was later used as the Town Hall, a courthouse and a prison. If you enter the castle you can reach the terrace that overlooks the river. In the Foirail park area you can follow the path along the banks of the Lot river. 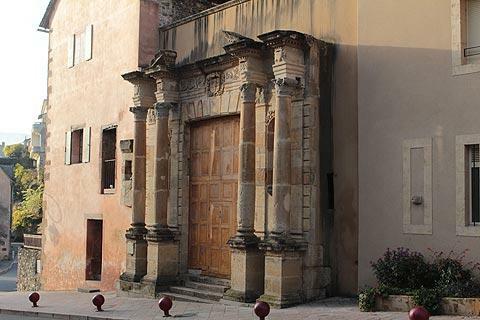 In the village behind the Old Palace there is an impressive doorway that was once the entrance to the Chapel of the Convent of the Ursulines, part of a large convent in Espalion in the 17th century. The chapel, on the north side of the river, was demolished in 1968 and the doorway was reconstructed here. Originally there were statues between the columns of the entrance. Along Rue du Plô from here you reach the Chapel of the Penitents, a small 18th century baroque chapel (open easter to october) with a lovely altarpiece. 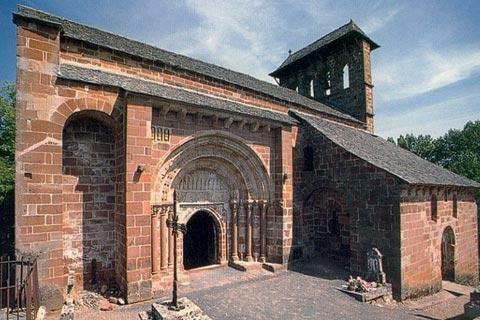 This chapel was built using stone from one of the towers demolished on the old bridge. On the Place du Puits is the 16th century house (with a round tower on the left) which is the birthplace of Pierre Assézat who subsequently became a rich merchant and built the elegant renaissance Mansion Assézat in Toulouse. This renaissance style houses is one of the most impressive townhouses in Espalion. 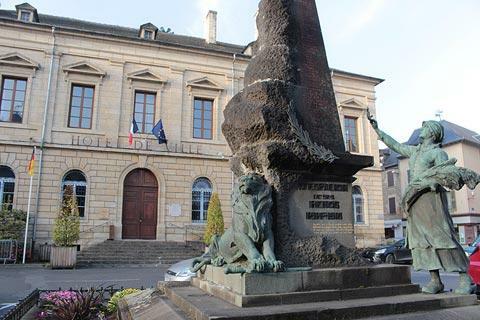 From here you quickly reach the Boulevard Joseph Poulenc, the main road through Espalion. 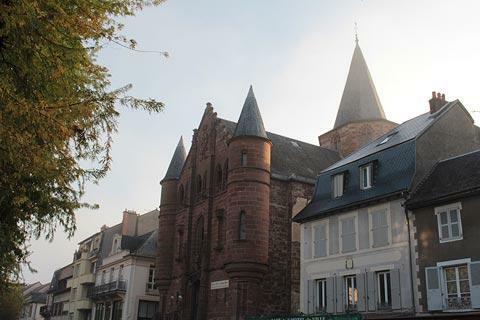 To the south there is an open square with several restaurants and shops as well as the Town Hall and the Michou Tower, the only tower that remains of the fortifications that surrounded the village in the 15th century. 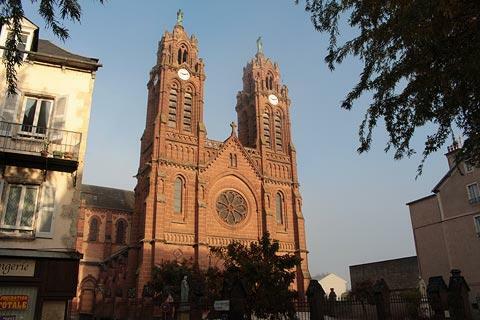 Walking south towards the bridge you pass two imposing churches: the 15th century Church of Saint John the Baptist (no longer used as a church) and the main 19th century church for Espalion: both churches have striking facades of red sandstone. There is also a diving museum (Musee du Scaphandre) in Espalion dedicated in particular to the invention of the first aqualung by Rouquayrol and Denayrouze both natives of Aveyron. 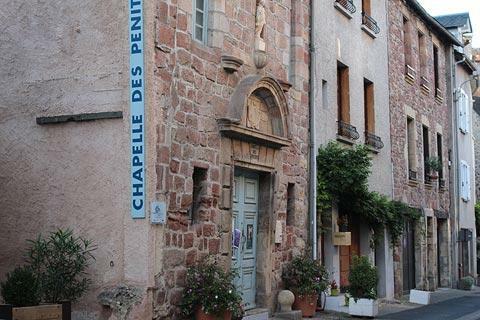 To the east of Espalion there is a 12th century church, the Eglise de Perse, which has conserved many of its original roman characteristics. Take a look at the carvings around the doorway (which seems rather too big for such a small church) then enter the church to see the carved capital stones. On the hill high above the town you can see the ruins of the ancient Château de Calmont d'Olt. There is not a great deal to see of the castle but the views across Espalion and the countryside make a trip worthwhile. There are various hamlets and villages close by that don't take long to explore but together make for a pleasant excursion from Espalion, such as Roquelaure, Lassouts, Flaujac and Saint-Come d'Olt. 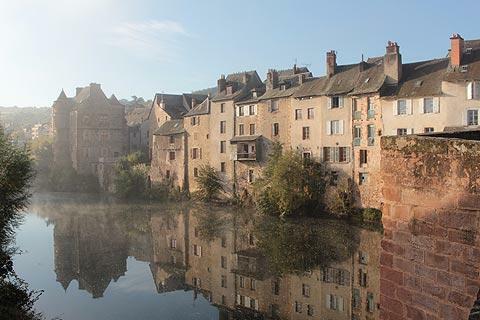 This is one of our favourite regions of France, both for the small towns and villages such as Conques and Belcastel and the scenic countryside - see exploring the Lot Valley.